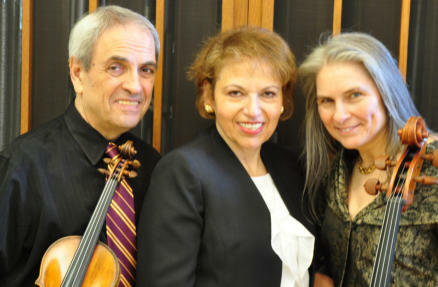 Diane Goldsmith is pianist with the Arcadian Trio, which includes some of the most in-demand string players in Philadelphia – violinist Igor Szwec and cellist Vivian Barton Dozor. 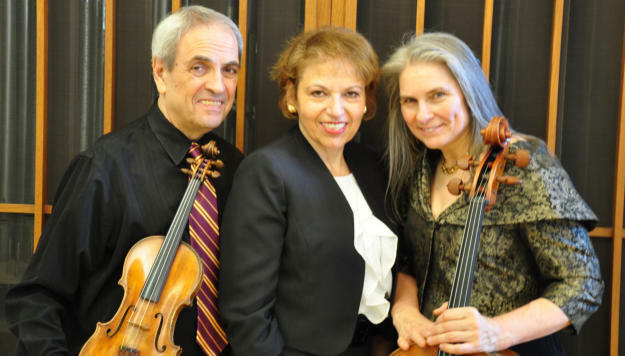 Hailed for its virtuosity and style, the group has been featured on prestigious concert series, presenting themed programs Diane has developed which include commentary – and in some cases, a multimedia format with images. “At Home with the Schumanns and Brahms” explores the love triangle between Robert and Clara Schumann and Johannes Brahms in a program that features works by all three composers, readings from their diaries and letters and historic images. This nexus of love and genius among the greats of the Romantic era has long intrigued historians of music. “The Evolving Classical Style” – a program informally known as “Music That Broke the Mold” – is about how, in turn-of-the-19th century Europe, the traditional forms and harmonies of the Classical era were giving way to a more expressive sensibility in music - Romanticism. The program begins with works by Haydn and Beethoven that clearly break with tradition and help blaze a new path to a supremely lyrical trio by Schubert. “Music with a French Twist” is a wonderful juxtaposition of the surprising and the familiar in French music from the late 19th and early 20th centuries. 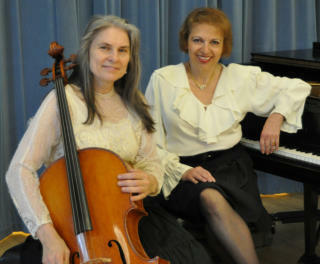 With music by Debussy, Chaminade, Faure and Ravel, it explores the development of the French sound during this period. “Conjuring the Slavic Soul” is a powerful program from the turn of the 20th century and beyond by Czech composers Antonín Dvořák and Bohuslav Martinů and Russians Sergei Rachmaninoff and Dmitri Shostakovich. The Other Musicians are: Igor Szwec is concertmaster of the Academy of Vocal Arts orchestra, assistant concertmaster with Opera Philadelphia’s orchestra and a charter member of the Chamber Orchestra of Philadelphia. For many years, he was also concertmaster of the Philly Pops. He received his training at the Philadelphia Musical Academy and did further violin study with Karen Tuttle. He’s played chamber music with such notables as Bernard Greenhouse, Menahem Pressler, Anton Kuerti and Samuel Baron, and is first violinist with the Meiravi Quartet, which performs new works by its violist Peter Nocella. He has been concertmaster for Orchestra 2001 and now continues in that capacity with First Editions. Vivian Barton Dozor is principal cellist with the Academy of Vocal Arts orchestra and VoxAmaDeus and assistant principal with Opera Philadelphia’s orchestra. A graduate of the Curtis Institute of Music, she’s appeared with such distinguished artists as Yehudi Menuhin, Alexander Schneider and Felix Galimir and performed in the Marlboro Music Festival, Philadelphia Orchestra, Orpheus Chamber Orchestra, Brandenburg Ensemble, and the Santa Fe Opera. While she’s played a number of premieres with the Network for New Music and First Editions, she also enjoys playing baroque cello and viola da gamba with Baroque and early music groups. Excerpt from Beethoven Trio, Op. 70, No. 2, 3rd Mvt. Excerpt from Chaminade Trio No. 2, Op. 34, 1st Mvt. Excerpt from Chaminade Trio No.2, Op. 34, 2nd Mvt. Excerpt from Chaminade Trio No. 2 Op. 34, 3rd Mvt. Excerpt from Clara Schumann Trio No. 1, Op. 17, 2nd Mvt.